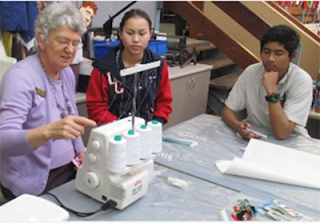 In 2015, Australian Sewing Guild members partnered with Greenwood College in Perth to further the art of sewing and foster an appreciation of the sewing/textile industry amongst students at the school! ASG members from the Northern Suburbs Group (WA) volunteered their time and sewing expertise to help Year 12 students achieve a Fashion, Design and Textiles Unit of Competency in their school art program. A number of students have now applied through Polytechnics to partake in the 2016 Textile Course. Glen Larcombe, Marion James and Glenys Brown visited the school one day a week during the school term to share their time and expert knowledge with a group of enthusiastic students. I’ve enjoyed my time volunteering for sewing at the Greenwood College. The students, both girls and boys, were all eager to thread and operate a sewing machine. Some of the pillow slips and cushions produced by the boys as a first attempt were surprisingly neat! I encourage ASG ladies to get behind and support the Guild with this project. By mentoring these students we keep the love of sewing and dressmaking alive. 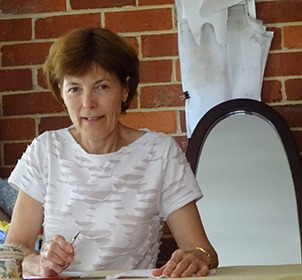 Thanks to the Perth Metropolitan Region for sharing this story!